Kick up your Pillsbury sweet rolls with a few extra ingredients for a delicious seasonal treat. 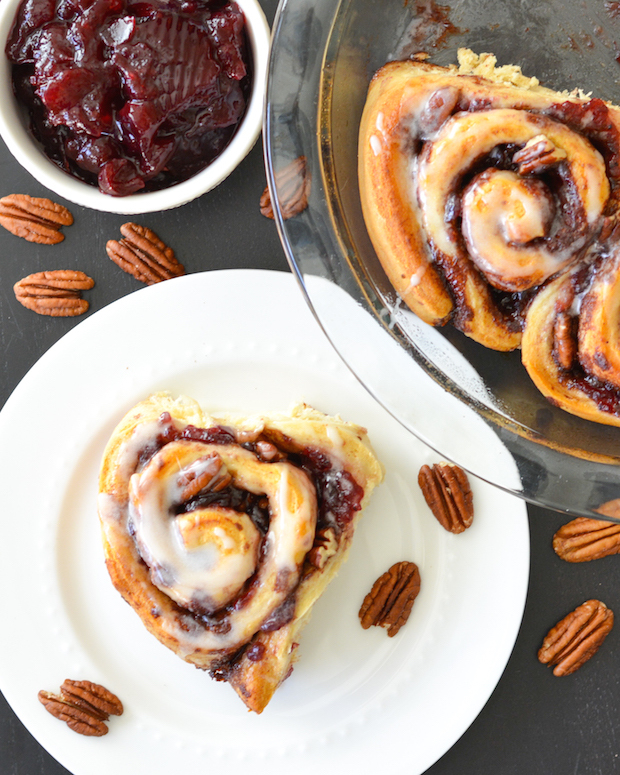 These Cranberry Pecan Cinnamon Rolls are perfect for Thanksgiving breakfast! Thank you, General Mills, for sponsoring this post! Now that Halloween is long gone, you know that means. Time to start thinking about Thanksgiving! Thanksgiving is quite possibly one of my favorite holidays because… well, you know… the food. It’s the one time a year I have roasted turkey, cranberry sauce, and pumpkin pie. Why is that Thanksgiving foods are so delicious and yet we only make them once a year? I guess if we made Thanksgiving foods more often it would take the fun out of the traditions of the holiday. Looking forward to those foods all year really does make it a special occasion. For me, Thanksgiving is such a fun day because from the moment you wake up the day is spent cooking! And of course, that’s one of my favorite things to do. I’ve spent many Thanksgiving mornings shelling chestnuts for stuffing, helping to peel apples for pie, or chopping onions, mashing potatoes. Anything I could do to help. All while watching the parade, and then football, and inhaling the heavenly smells coming from the oven. On Christmas morning, our family has always had a tradition of eating croissants for breakfast. They’re one of my Frenchie dad’s favorite indulgences, and we look forward to them every year. I realized that we needed a Thanksgiving breakfast tradition as well! 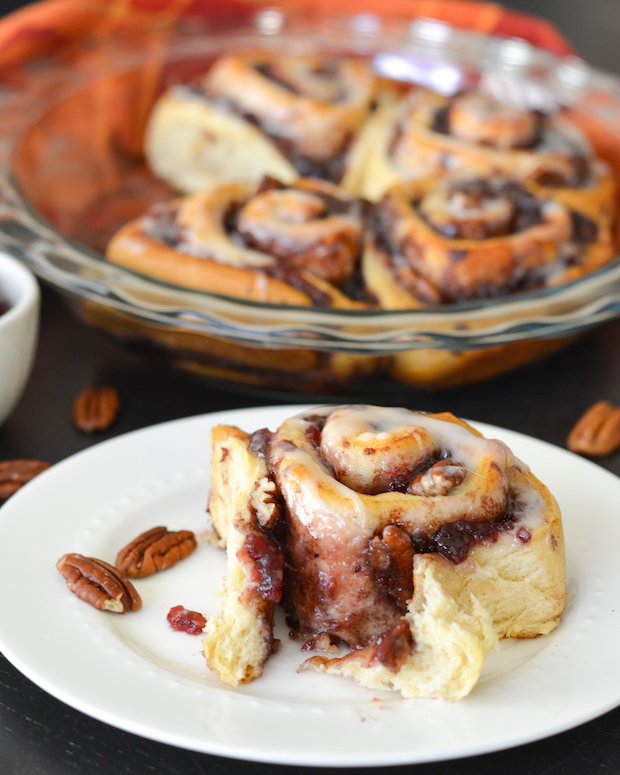 Besides croissants, one of my favorite indulgent breakfast treats is cinnamon buns! And since Pillsbury makes it so easy to bake up some fresh-from-the-oven sweet rolls, they seem like a no-brainer. There is so much cooking going on Thanksgiving morning, it’s great to have a quick and easy option to pop in the oven for breakfast. I can’t go too easy, of course. I’ve always got to add my own creative spin to things. 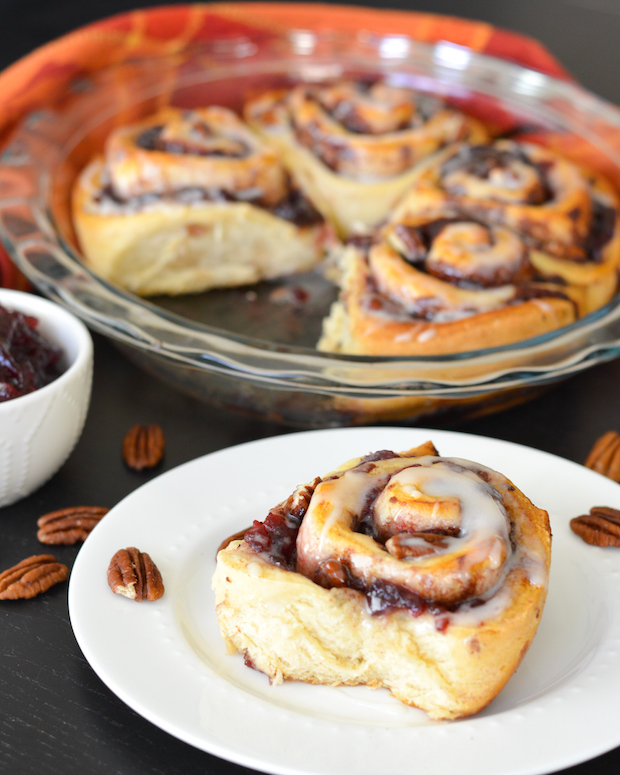 I thought it would be really fun to add some seasonal flavors to these cinnamon rolls. Cranberry and pecan are a yummy combination with the cinnamon, and an easy way to add some holiday flair. And chances are you already have cranberry sauce and pecans on your Thanksgiving grocery list! I hit up Walmart for supplies. 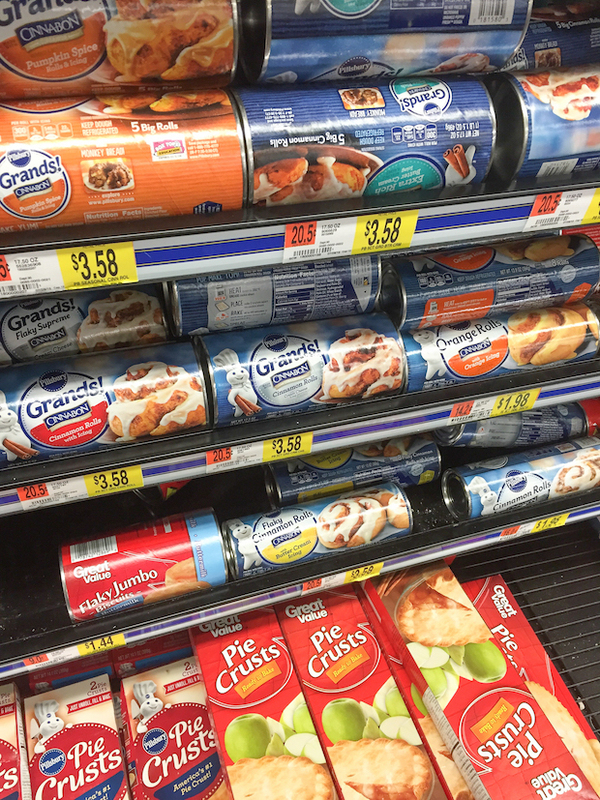 They had a huge variety of Pillsbury products and I had several sweet roll varieties to choose from. I decided to with Grands!® Cinnamon Rolls since they’re extra big! They had several flavor varieties, and you could use any of them. I went with the classic Cinnabon Cinnamon Rolls with Icing. Preheat oven to 350 degrees. Grease a 9-inch pie dish and set aside. Open sweet roll package and set icing aside. Separate sweet rolls. One by one, carefully unroll each sweet roll. 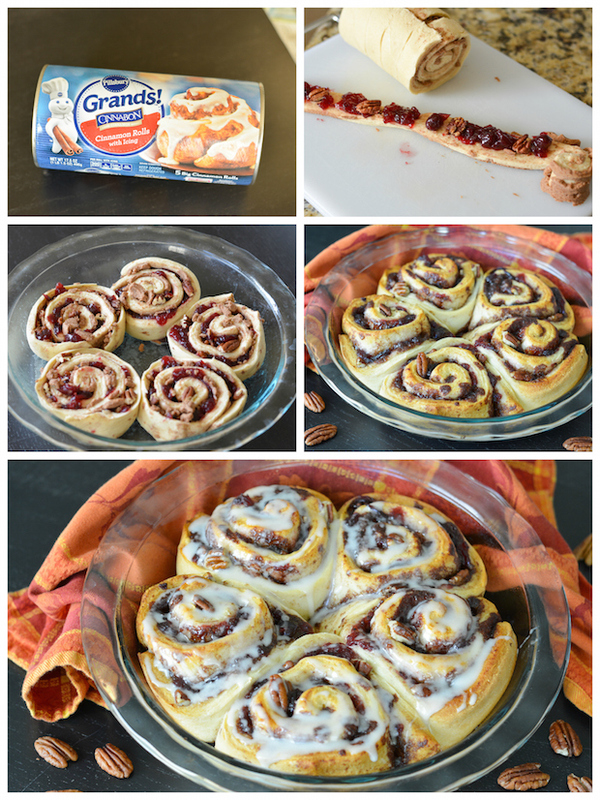 Once you have a sweet roll unrolled, spread a thin layer of cranberry sauce along inside of dough strip. Sprinkle some pecans over the cranberry sauce. Tightly re-roll the sweet roll and set in greased pie dish. Repeat with remaining sweet rolls. Bake according to package directions (or about 22-25 minutes) until rolls are golden brown. Remove from oven and spread icing over top. Serve immediately. These were so yummy and such a fun treat. I’ll definitely be making these again on Thanksgiving morning and hopefully starting a new family tradition! What are your favorite holiday traditions? How do you spend your Thanksgiving morning?